August was a pretty slow reading month due to all the podcast listening. I don't know why I didn't consider that this would happen when I set my podcast goal, but oh well. I did manage to get a couple books read. At Bertram's Hotel by Agatha Christie was definitely not my favorite of her books, and I had no qualms tossing this one into the book destined for the thrift store when I was done. It's a Miss Marple mystery, but it was just missing something. The characters where ho hum, and the mystery just seemed far fetched and unbelievable. God Speaks Tenderly by Marie Shropshire was much better than I expected. I went into it not expecting much, but I really came away with some applicable insights. My job gets under my skin a lot. I've had more headaches, insomnia, and nausea than I can remember with any job, but there's perks too- I like the people I work with, I like the residents, I don't mind most of the work, so what do you do? Sometimes I feel like God puts you someplace to work on something in your life. Maybe it's patience, or empathy, or even your courage. I know there's plenty I need to work on, and you can't just quit something because it's hard, but sometimes growing feels like an impossible task. Walking in This World by Julie Cameron is a companion book to The Artist's Way. It stresses the importance of walking for getting the creative juices flowing, as well as giving insights into nurturing your work. It was a good read, although I will admit, it did take me a while to get into it, and actually a while to finish it. But, I am keeping it on my finished book shelf because I feel I may want to read it again in the future. And as far as what I added to my book piles? Nothing. I didn't buy a single book last month. That makes my totals at 25 books read this year and 22 added to my shelves. 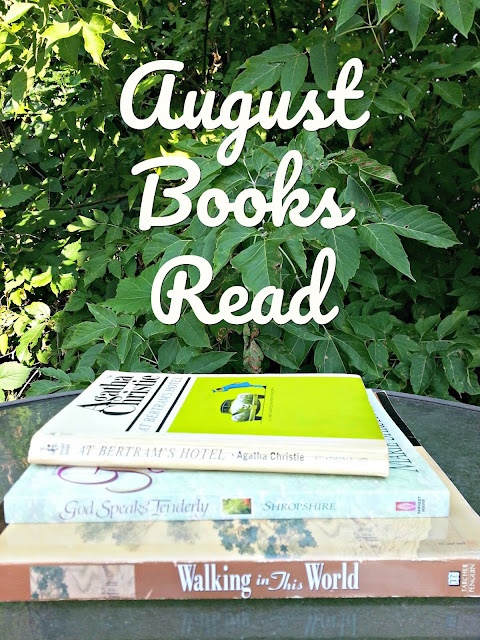 I'm aiming for at least five books read in September, because I really need to step up my game if I'm going to make my yearly goal of 48 reads.